OMC (oh my cute!) 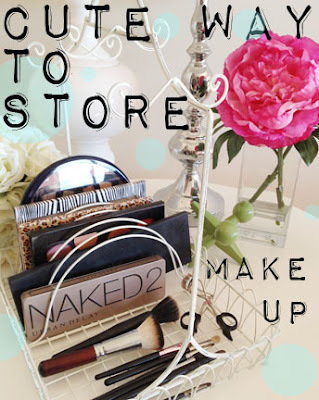 way to store make-up! 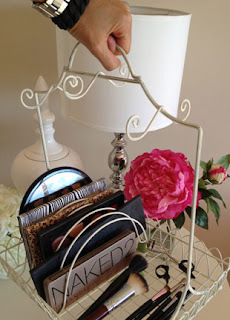 Now, I know I already posted about how easy it is to store your make-up palettes in a dish rack, dish drain rack (whatever you want to call them)..see here if you missed that post. you can easily pick it up and move it where ever you need...store it in your bathroom, under the sink, and then move it to wherever your lighting is good to put your make-up on..
you could even store larger palettes or make-up goodies that are too large to fit in the (dish) slots. 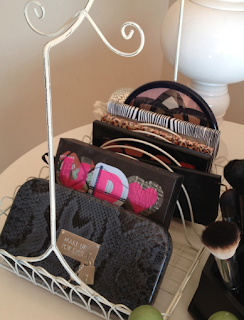 And if anyone wants to know...the animal print palettes in here are my fav Z Palettes that are magnetic palettes you can put whatever eyeshadows or blushes or powders you want, in them- click here to check em out. This was just too cute! A girly, whimsical, romantic, kinda' shabby chic, vintage way to store your make-up- and all that is right up my alley! CLICK here to "internet travel" to my KANDEELAND blog. Wow, what a great concept. I may just have to purchase one of these. Thanx for sharing , Kandee! Cute!!!! I like this idea!!! 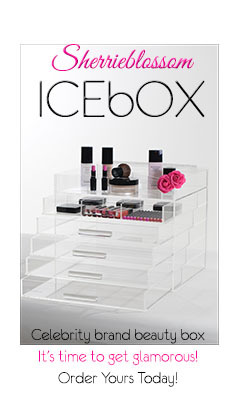 If you have suggestions on how to store tiny palettes or individually packaged shadows please let me know!!! Thanks!